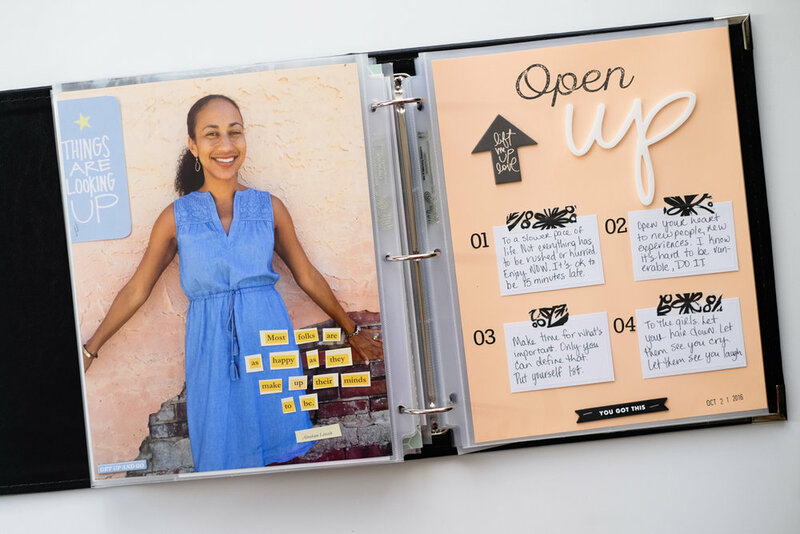 I still love working on story theme layouts using Ali Edwards' theme kits. I enjoy the monthly prompts to document my story as opposed to documenting our family story which I do with my Project Life spreads. January's theme was numbers, and there was so much goodness included in the kit. Honestly, I completed 4 layouts with the kit! So many stories to tell. And as a math minor in college, and a Type A personality, you can be assured that I thrive on numbers! For the layout I'm sharing today, I printed a 2.5 x 11 inch copy of my photobooth strip from the Ace Hotel during my trip to Portland. I included the "numbers" piece with a list of numbers that make up my life. I love adding things that are true for me right now. I know they will change in the future. I added a additional piece of washi tape to the right side of my layout and stamped the date at the bottom. Here's how it looks in my album. If you are interested, you can check out my other story theme layouts: Build, Go, Little Things, Click, Magic, Firsts, Gather, and AM/PM. It's been a while since I've completed a layout with Ali's Story Theme kits. I am definitely behind, but I continue to enjoy creating these layouts. Ali has a way of getting me to think, dig deep, and document a story that I know I will love to read in 20 years. Here's my layout from the August 2015 Build Story Theme. As usual, I started with a photo foundation. I wanted to tell the story of something I am currently building, one day at time. And for me, that is most definitely my film cameras and a collection of images. I have added a camera to my collection each time that I wanted to experiment and push my boundaries. I have taken images with each of these cameras that I hold near and dear to my heart. I love that I was able to document this story. I really liked Ali's example layout of a up close image alongside a shot with a wider scene. 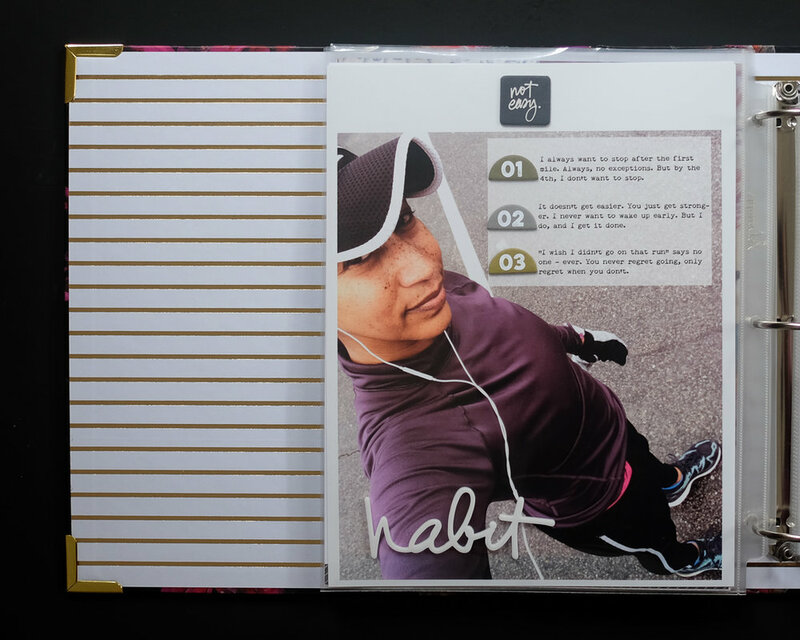 I paired for these two images together and added a 4x6 card from the kit directly on top of the right hand photo with my journaling. 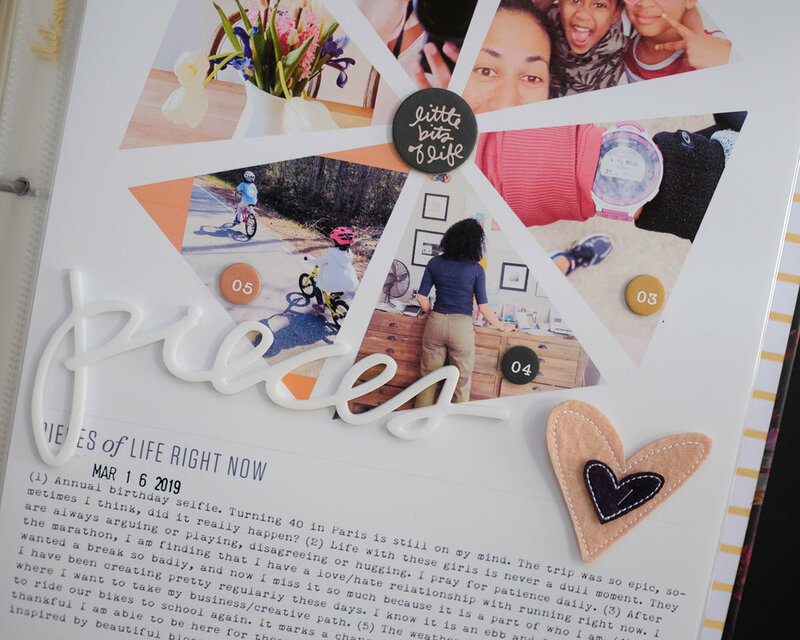 Now that I have the fuse tool for my main Project Life album, I have been addicted to adjusting page protectors as I need them. It is truly liberating to create layouts and not be limited to the pockets in page protectors, but creating my own. For the right hand side of this layout, I used the fuse tool to create a 6 x 11 page protector from a 8.5 x 11 inch We R Memory Keepers page. And here is how it looks in my album. I am using a We R Memory Keepers 8.5 x 11 Classic Leather Album to hold all of my story layouts. If you are interested, here are my previous story theme layouts: Go, Little Things, Click, Magic, Firsts, Gather, and AM/PM. 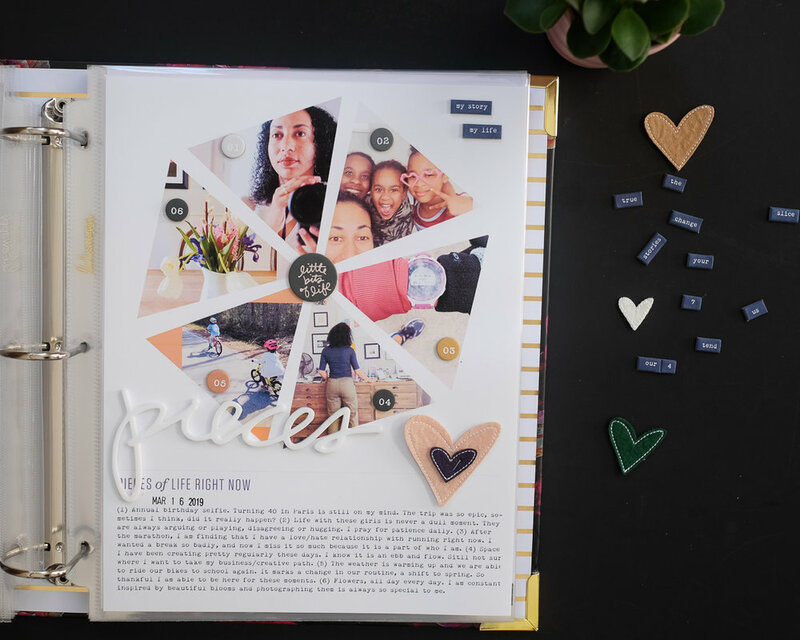 If you have followed my story theme layouts with Ali Edwards' theme kits, you know that I usually use the monthly prompts to document my story as opposed to documenting our family story which I do with my Project Life spreads. 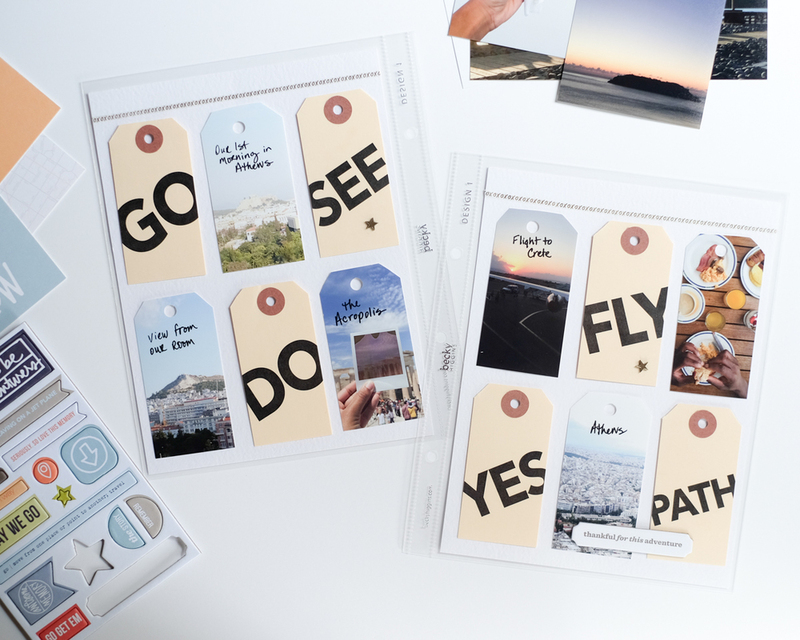 Switching gears a bit this month, I decided to use the June 'Go' Story Kit to document our anniversary trip to Greece. As usual, I am a bit behind keeping up with the monthly prompts but I love creating these layouts. I am documenting our trip in a 6 x 8 inch album, which is separate from my regular Project Life spreads. 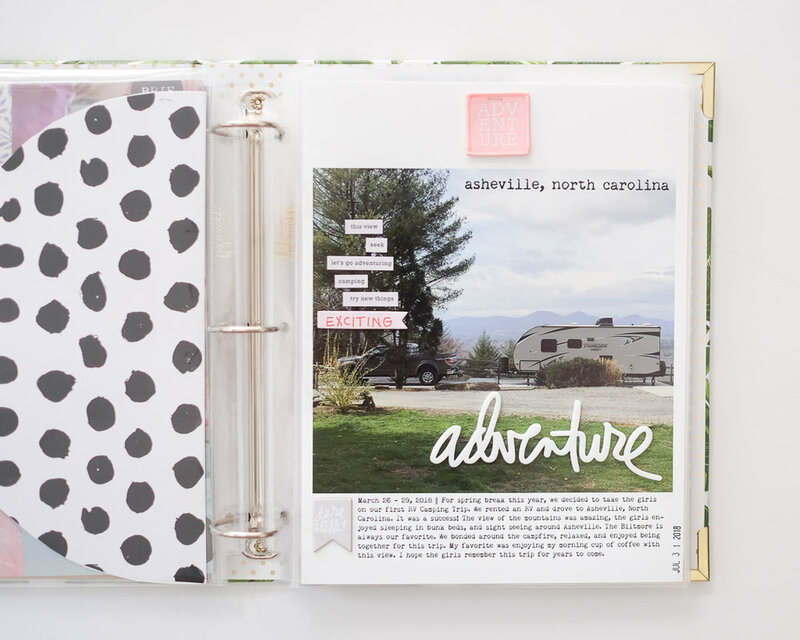 I shared a previous layout from this album in my post July Layouts with Paislee Press. Instead of the black 6 x 8 inch album, I recently found a navy and white strip album in the same size from Michaels. I can't seem to find a link, but it definitely reminds me of all the blue and white colors of Greece that was so evident while on our trip. I love these manila tags that were included in the 'Go' story kit, and knew immediately that I wanted to use them for documenting this trip. This layout is inspired by Ali's example from the class. I cut white textured cardstock into 6 x 8 inches for the base pages. I attached the tags with Scotch mini tabs in order to make them stand out a bit. In Photoshop, I cropped six images approximately 3.5 x 1.7 inches and used one of the original tags to cut each photo into the same shape. 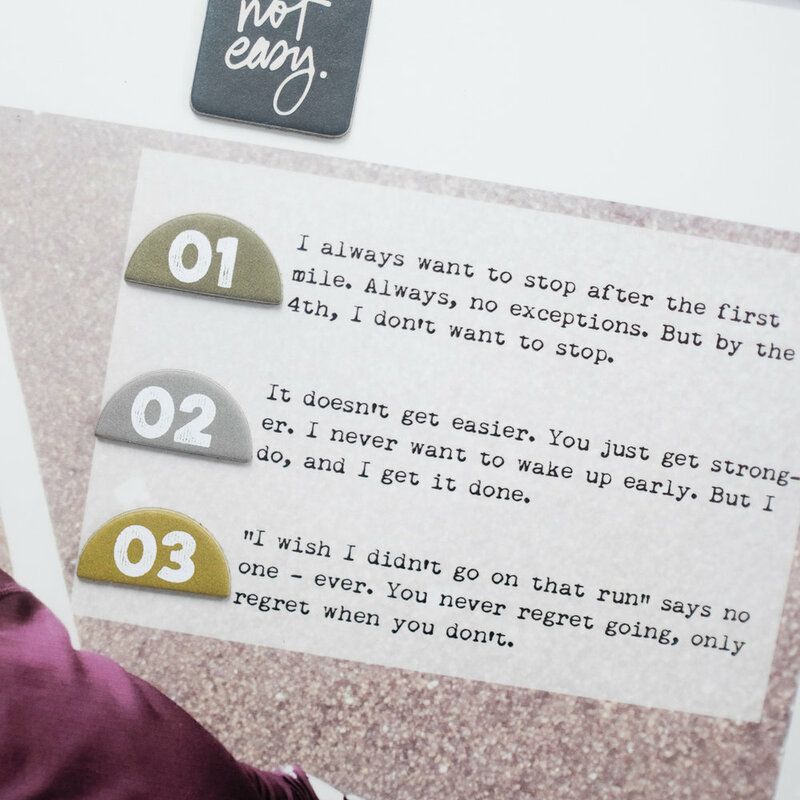 Finally, I added a little bit of journaling directly on the images. I love how simple and clean this layout is. And here's a look at the layout in my album. I'm slowly, but surely, working on documenting this trip, which I plan to share more of as I complete it. Here are my other story theme layouts: Little Things, Click, Magic, Firsts, Gather, and AM/PM. Products used in this layout: Go Story Theme Kit, Becky Higgins Design 1 page protectors, White textured card stock, and the "XO" washi tape is from my stash (can't quite remember where I picked this up). I continue to love Ali Edward's monthly story themes. I subscribe to her story kit, which always includes such amazing products, but what I find myself loving even more are the story prompts. Ali has a way of making me dig deep in order to tell my stories. May's story theme was "little things". I am a bit late keeping up with the prompts, but I always enjoy creating these layouts. Earlier this year, I decided that I am using these story theme prompts to tell my story. While I enjoy documenting our family story, and my own stories and memories often get overlooked. Using one of Ali's layouts as inspiration, I decided to document 36 little things that I am grateful for. 36 little things - one for each year of my life. In Photoshop, I cropped a 8.5 x 11 inch photo of myself. 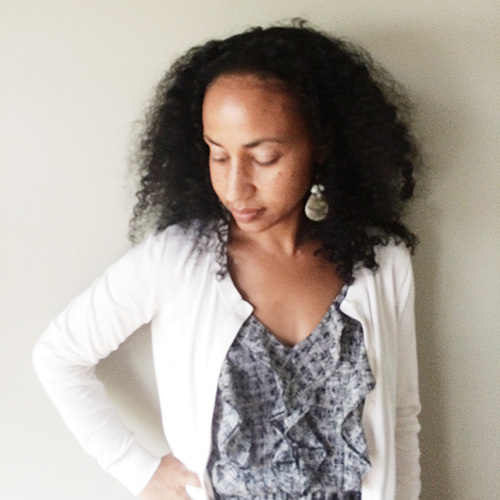 I added 36 little things that I am grateful for right now. I printed at home and added a chipboard sticker from the kit to the top of the layout. The '3' and '6' were from my stash - and I layered the plastic "little things" right over the numbers. Super simple, and most importantly, done! And here is how it looks in my album. If you are interested, you can check out my other story theme layouts: Click, Magic, Firsts, Gather, and AM/PM.